High school girl Kii falls in love with tough-boy Hazuki after witnessing his remorse after he nearly punches another student. The other students fear Hazuki because they believe he loves to punch people, and when Kii shows interest in Hazuki, her classmates shun and fear her the same as they do Hazuki. 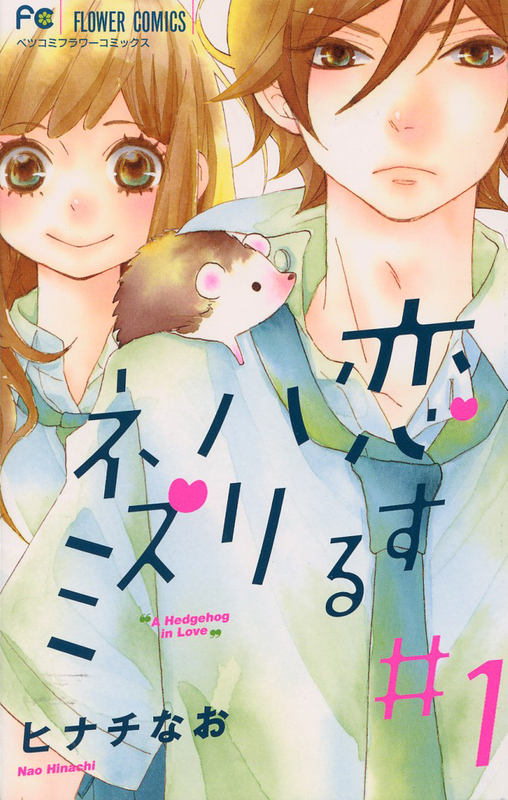 The first volume revolves around showing Hazuki’s misunderstood kindness, deals with Kii pressuring Hazuki to specify what kind of “love” he feels for her, and Kii fretting over whether Hazuki is in love with a beautiful older single mother. First impressions: The pacing saves this manga. I was more interested in Hazuki’s potential crush on Yukino, an older single mother, than in the main relationship. Artwork B: The design of the main characters is cute. The thickly drawn upper eyelashes puts a lot of emphasis on the characters’ eyes. A great amount of care is given to the characters’ hair. The main characters’ have lively hair with lots of loose curls and flounce. As usual, I’m a little disturbed by the main female character’s toddler-looking face. The same is also true for the male main character whose face is toddlerish and very feminine. It was a little awkward at first until I got used it and accepted that this is the mangaka’s drawing style. 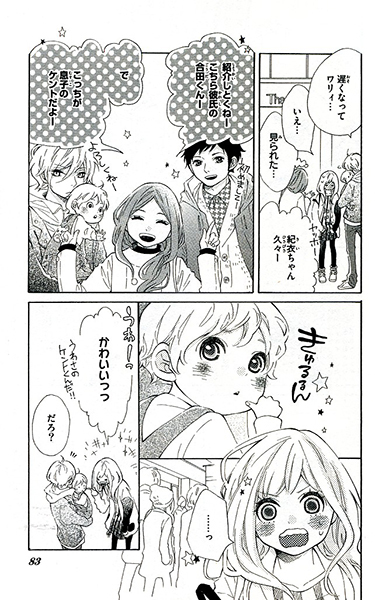 The panels look like typical shoujo. There are lots of screentones used that make the panel seem cluttered at times. The flow around the panels is fluid. I had no problem following the flow of dialog and action. Presentation B: I love the cover illustrations. I’m a sucker for the pastel-watercolor look. The frontis pages look really nice and, as usual, I wish they were in color like they were in the magazine. The book is a typical shoujo book: there are no color pages and format is small. I did not have any trouble reading the typed and handwritten text. The mangaka’s handwriting is reasonably legible. Story C: This is a slice-of-life high school manga, so there isn’t a plot. Rather it’s a character study. The pacing is pretty fast, so there was no time for me to get bored. The series is supposed to center around the relationship between the main characters Kii and Hazuki, but I found myself more interested in Hazuki’s relationship and feelings towards Yukino, the older single mother he befriended. Kii is a typical shoujo bland girl with a permanently blushing face who is obsessed with whether the main male character is in love with her. Hazuki compares Kii to Yukino’s toddler, Kouta, which seems quite apt, especially when Kii becomes a lost child at the mall. I can’t tell whether this is accidental or whether the mangaka is purposefully poking fun at her own bland-girl shoujo heroine. Since I don’t care about Kii’s vapid thoughts and feelings, I think I would have enjoyed this story more if it were told from Hazuki’s point of view. His frustration with how he feels about Kii and Yukino are potentially much more interesting than Kii whining about whether Hazuki loves her. The only reason why I’m continuing the series is to see how the situation between Hazuki and Yukino is resolved now that Yukino is going to marry her baby’s father. The romance between Kii and Hazuki is rather weak and unbelievable at this point. Readability Medium: This series uses typical shoujo vocabulary. There is a lot of text on some pages, so reading can become a bit tedious, especially if the story doesn’t hold the reader’s interest. Overall B-: This is a cute typical shoujo. The main couple is weak and overshadowed by the male main character’s crush on a secondary older character. I’m going to read the next volume because I’m interested in the secondary relationship, however without this relationship, this series is too typical for me to feel the need to read further.